In Romania, the growth setback following last year’s bumper harvest and export boom seems to be more severe than expected. The decline in investments, both private and public, has accelerated. Alongside exports, the recovery of private consumption, benefiting from fiscal support, has become the new driver of economic growth. The government intends to continue down this track in defiance of IMF recommendations. Improved political stability under a new president to be elected in November may improve the efficiency of the country’s administration. 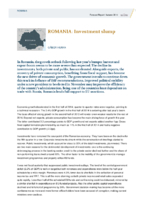 Being one of the countries least dependent on trade with Russia, Romania lends full support to EU sanctions.